Anubis, the Dark Warlord of Cruelty, is the leader of the four Dark Warlords who serve under the evil emperor Talpa. He uses a sickle and chain as his weapon during battle. His signature attack is Quake With Fear. His original name in the Japanese version is Oni Mashou Shutendouji (Orge Demon General Shutendouji). 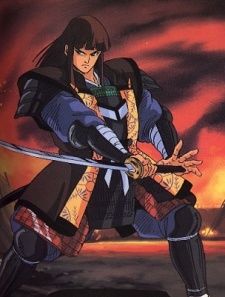 His yoroi (armor), which represents Spring, is infused with the virtue Chuu (Loyalty). Shutendouji (Shuten for short) is the official leader of the four Mashou and is also the first to betray Arago (Talpa). He becomes the second "shown" Kaos (The Ancient One) within the series and later dies repelling Badamon from Kayura (thus saving her from captivity). His Choudandou (loosely Ultimate Technique) is called Ko Rai Sen (Red Lightning Flash).